Spot treatments and other liquid treatments for Drywood Termites, Subterranean Termites and Powderpost Beetles are effective when the infestation is minor, the location and extent of the infestation has been determined and the area is easily accessible. If the infestation is severe, the extent unknown or the location inaccessible, the inspector may recommend fumigation and/or the complete removal and repair of the portion of the structure that has been compromised. Fumigation is the only treatment that is more than 99% effective for eradicating drywood termites and powderpost beetles. Treatments for Fungus and Dryrot are applied in a different manner and always include the elimination of the moisture source that caused the conditions. For fungus infestations, a “scrape and treat” method is often recommended where the surface fungus is scraped away to remove the majority of spores then the remaining surface is treated with a fungicide to eradicate remaining spores. In the case of dryrot, if the severity of the infestation is significant, then complete removal and repair of the infested area is recommended; however, if the infestation is minor or the source of the moisture clear, then alleviation of the moisture source may be sufficient. 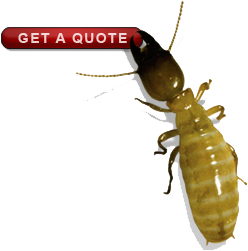 *The liquid used for spot treatments by 4 Less Termite, Inc. are standard in the industry and are specifically designed for the wood destroying organism(s) being treated.